Now, perfectly in line with that trademark phrase, The Liberace Foundation for the Performing and Creative Arts (www.liberace.org) teams with Michael Dezer Presents Hollywood Cars Museum at Hot Rod City, Las Vegas (www.hollywoodcarsmuseum.com) for the launch of a dedicated Liberace Garage, featuring many vehicles associated with him and his performances- several of which were driven onstage as a dynamic element of his shows. Kicking off the permanent exhibit in high gear, Hollywood Cars Museum and The Liberace Foundation for the Performing and Creative Arts are hosting a special reception at the museum from 6 p.m. to 9 p.m. Thursday, April 7. The catered cocktail reception, which will include Champagne, cocktails, hors d’oeuvers and live entertainment, is a fundraiser for the foundation, which has provided over $6 million in scholarships in the creative and performing arts since 1981. Tickets are $50. The Hollywood Cars Museum is located at 5115 Dean Martin Dr., Las Vegas, NV 89118. The Liberace Garage will officially open to the public on Friday, April 8 starting at 10 a.m. Among the vehicles on display at the Liberace Garage is the 1961 Rolls Royce Phantom V that Liberace used to drive onto the stage when he performed at the Las Vegas Hilton. The Foundation lent it to the production of the Emmy and Golden Globe Award winning HBO film Behind the Candelabra, starring Michael Douglas and Matt Damon; Douglas, as Liberace, drove it on the stage. The Liberace Garage also includes the crystal encrusted roadster that he had onstage during his final run of shows at Radio City Music Hall in 1986; a red, white and blue Rolls convertible which he flew out of via high wire cables at Hilton shows celebrating America’s Bicentennial; and a large handful of cars he drove regularly, including the London Taxi (with the meter still installed) that he used to pick up famous guests from the Palm Springs Airport and the 1956 Rolls Royce convertible which he would fly out of during performances. 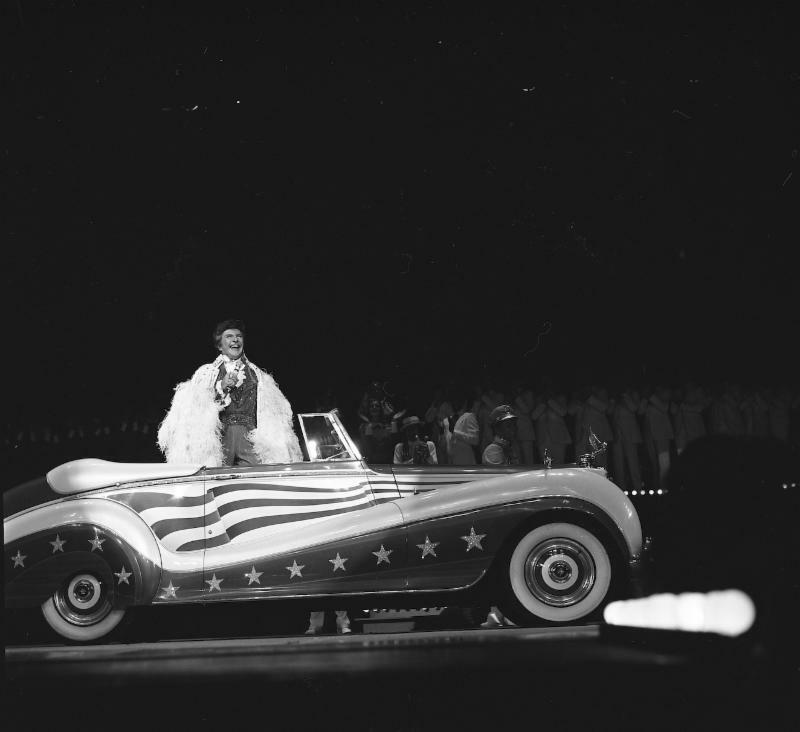 The exhibit also features automotive related Liberace souvenirs, including light posts he kept in his personal garage, film posters and auto advertisements the entertainer appeared in, and, naturally, chandeliers. According to Jonathan Warren, Chairman of the Liberace Foundation for the Creative and Performing Arts, the idea for the Liberace Garage at the Hollywood Cars Museum grew out of the success of an exhibit of the entertainer’s famous costumes and cars at the Cosmopolitan Hotel in 2014. Due to overwhelming public demand, the expected six week run of “Too Much of a Good Thing Is Wonderful” was held over for nine months. The Hollywood Cars Museum at Hot Rod City is a collaboration by Michael Dezer (www.dezercollection.com), owner of one of the world’s largest vehicle collections at the Miami Auto Museum. It features vehicles that have appeared in more than 100 films, TV shows and videos.